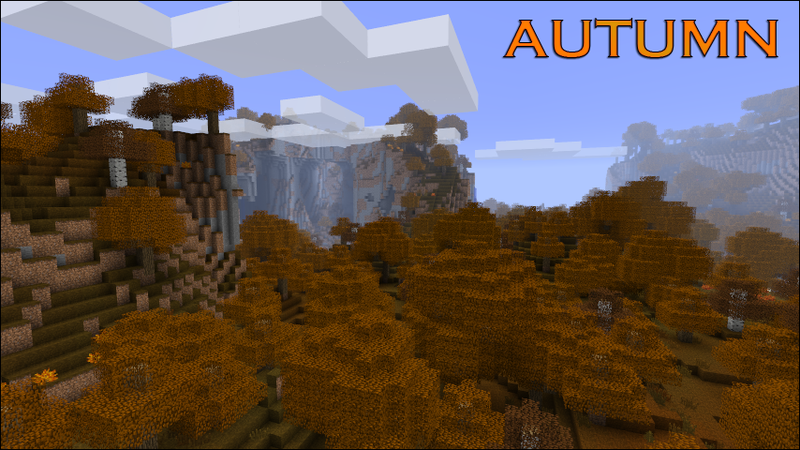 The Seasons Mod, originally by Nandonalt, is now updated! 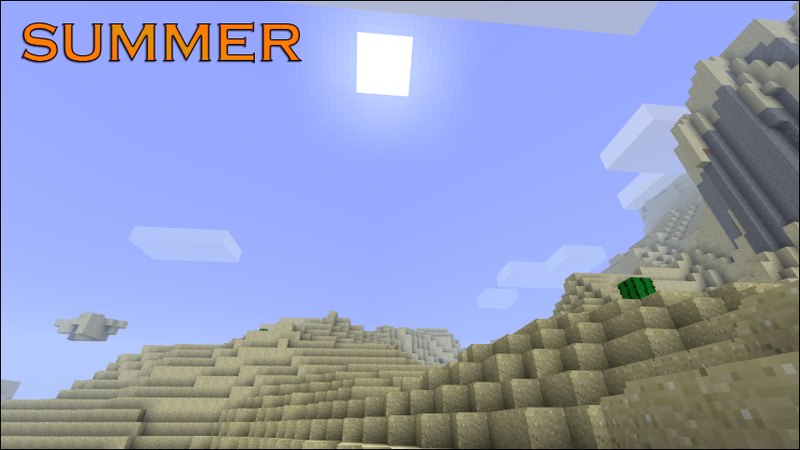 Seasons Mod Minecraft mod 1.8.9/1.7.10 adds the four seasons to Minecraft: Spring, Summer, Autumn and Winter! 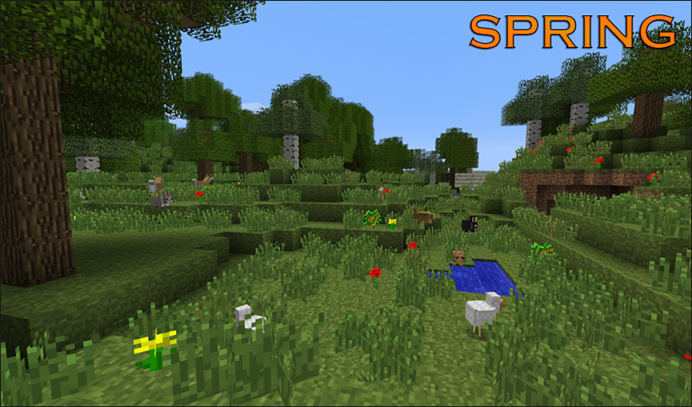 The Seasons Mod is SMP-based, and all clients connected to a server running the mod will experience the same season at the same time, within the same world/dimension. By default, the seasons each last seven Minecraft days, but their durations can be changed per- world/dimension. When creating a new world, or loading a world that hadn’t been loaded with the mod previously, the world will start somewhere in a random season. This may lead to a seasonal transition moments after starting/loading/joining the world. An image will be shown when transitioning from season to season, and will disappear after a few seconds. In Summer, all rains will be thunderstorms. Instead of snowing, it will only rain in snowy biomes, but they won’t defrost. Wheat will also grow 1.5x faster than in any other season, as if absorbing all that yummy heat. When in a desert biome, exposed to the sun, and not wearing protection (leather), you’ll get hurt every so often from dehydration and burns. Summer rain will destroy most of the plants generated from Spring. 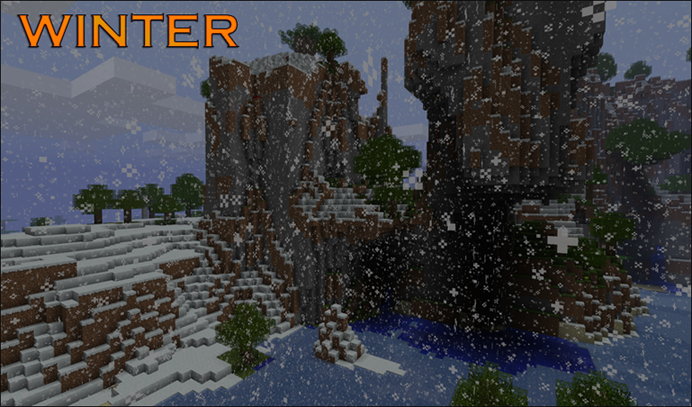 Just like the Spring, it will defrost the ice/snow generated from Winter in non-snowy biomes. Finally, days are longer and nights are shorter(disabled). Grass and Leaves have a modified color. Red and yellow flower textures change to accompany the color of the grass in Autumn. You’ll also get bonus wheat while harvesting. It’s always snowing in Winter, except in the Desert. In already cold biomes such as Tundras, Taigas, and Ice Deserts, the temperature drops even further, and can cause frostbite and slow you down, unless you have on protection (full leather armor). Lastly, days are shorter and nights are longer(disabled). Tall grass and plants (even custom plants, if added to the config) will grow on grass blocks affected by direct sunlight. Right-Clicking while holding this will tell you the Season, current Season day, and days left in the Season. Right-Clicking while holding this will tell you the current biome and temperature in ‘%’ for where you are standing. Please note that temperature is not affected by ice, lava, etc. and each X,Y,Z has its own temperature. There are some hidden items, but they are found, rather than crafted, and are very, very rare. These items are powerful, but the odds of finding them is almost zero. Then drag and drop the contents of the .zip file into your minecraft.jar. Do not place this mod in your ‘mods’ folder. Install Forge or LiteLoader with Forge. Add the contents of the “libraries” folder in the download to the “libraries” folder of the minecraft directory. Add “WeatherPony.launch.WPLTweaker” to the cascading tweaks in “minecraftArguments” and the following to the “libraries” part of the profile’s .json, maintaining json formatting.